January and February might seem to put a chill on love in the great outdoors, but winter clearly arouses interest among some critters. Great horned owls have been having a hoot for the past month or so as they’ve become extraordinarily vocal to pair up with mates. Because these birds are among the first to nest each year – as early as late February – they often usurp old nests from other species. Bald eagles also are amorous this month. Although they often mate for life, pairs usually don’t winter together. So they’re reuniting near their nesting sites, staking out territory and getting to know each other again as they rev up their reproductive engines. They will engage in high-pitched chatter before whipping their longings to a libidinous pitch in courtship rituals that include swooping together in flight, locking their talons and tumbling earthward before breaking apart seconds above the ground. 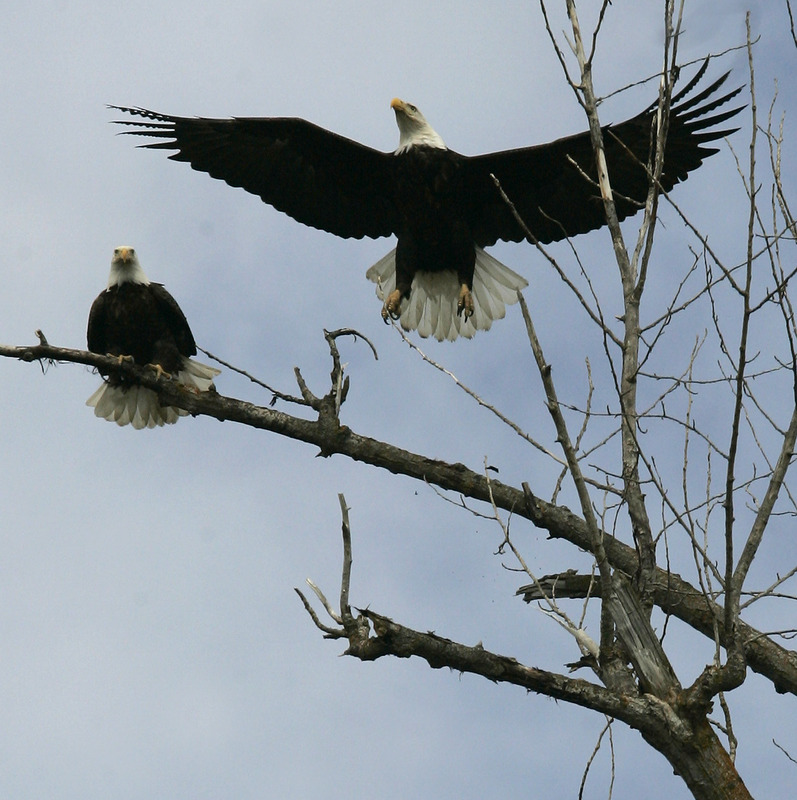 Bald eagle courtship begins in Washington any time from early January through late March, Washington Fish and Wildlife Department research shows. Incubation, which lasts 35 days, has been observed starting as early as Feb. 23. Wild turkey toms have begun gobbling and strutting their stuff. Coyotes look their best this time of year, as they pair up. They’ve already been checking out den sites – God help any pet dogs straying into the territories they’ve been staking out. Copulation already has been taking place. Motherly love already is under way since black bears and grizzlies were giving birth in their winter dens around the end of January. Drowsy moms have been tending to an average of two cubs born blind and helpless, weighing about a pound for grizzlies and half that for black bears. While mom continues with her hibernation, the cubs fatten themselves by nursing rich milk that is 20 to 40 percent fat – human milk is about 4 percent fat. Mom wakes occasionally to lick the cubs clean. A lot of growing up will take place in seclusion before we might spot 8-pound cubs emerging with their moms in late May. Thanks to area wildlife biologists Mike Rule, Jay Shepherd and Russell Link as well as Bruce Auchly in Missoula for assisting with this column.